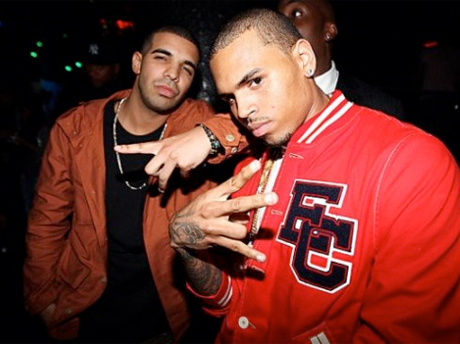 Last June, Canadian rap hero Drake and widely reviled R&B singer Chris Brown, as well as their respective entourages, got into a massive brawl at New York's W.i.P. nightclub. The fight, which allegedly stemmed from the pair's relationships with Rihanna, has already resulted in lawsuits. Now, yet another legal battle has emerged, as Drake and Brown are apparently suing one another over the incident. TMZ reports that both musicians have filed papers requesting that a judge blame the other for the incident, meaning that it will be up to the courts to decide who is the guilty party. Whoever loses the suit may have to pay damages to French model Romain Julien, who previously sued both Drake and Brown over injuries he allegedly suffered during the fight. Reports from last year indicated that the brawlers trashed the nightclub, creating large amounts of broken glass and injuring bystanders in the process. Basketball player Tony Parker subsequently sued the club owners for $20 million, while club owners Entertainment Enterprises Ltd. sued Drake and Brown for $16 million.